The next edition of Elsevier’s Engineering Academic (EAC) Challenge featuring Knovel and Engineering Village starts September 10, 2018. Are your students ready to play? Join this webinar to learn more about game-based learning and see a sneak preview of the challenge. This webinar is geared toward engineering faculty members and will focus on integrating Knovel and Engineering Village within engineering projects & assignments. Live demonstrations and practical tips on how to embed these trusted research platforms within engineering courses, projects, and assignments will be shared. Academic institutions around the world use Knovel and Engineering Village to inspire and educate the next generation of engineers and produce scholarly research backed by validated resources. These tools, which contain journals, books, conference articles, dissertations and standards, are some of the most powerful tools in an engineer’s tool kit. By teaching good scholarly search practices, the EAC helps students prepare for careers in engineering and research.. Universities are ideal hubs for students to build knowledge synthesis and create skillsets. But, many undergraduate engineering students don’t take full advantage of the powerful information and resources that are available to them through institutional subscriptions. However, there are pedagogical strategies faculty can adopt to grow learners’ capabilities through knowledge synthesis, including leveraging tools like Knovel, Engineering Village, and Elsevier’s game-based learning experience called Engineering Academic Challenge. As technological change mediates virtually every realm of human life, the role of the engineer is expanding significantly and it is important that engineering educators are helping students prepare the new roles. While the foundation of a strong engineering education remains unchanged, the research tools that engineering graduates will employ throughout their careers are rapidly becoming more powerful and networked. As the engineering profession changes, however, advances in engineering education have been slow to come, despite prominent calls for change from bodies such as The National Academy of Engineering, ABET, and the National Science Foundation in the US. * Ways to effectively incorporate databases such as Knovel and Engineering Village into a innovative engineering curriculum. In the face of inevitable regulatory changes, engineers must become savvy in their ability to respond to and anticipate change in order to limit product failures due to health, safety, environment and regulatory reasons. Striving for EHS excellence and risk reduction requires difficult decisions and trade-offs that need to be backed in data and best practices. In this webinar, we will look at how Knovel helped solve EHS and regulatory challenges for companies across industries. The learnings from these case studies can be applied to your own EHS issues. Knovel helps companies tackle development and production challenges by providing foundational engineering knowledge, best practices, and interactive data to support EHS risk reduction. When managing process safety and asset integrity issues, corrosion is a pervasive and complex problem. The serious risks are of global concern and cause material waste, plant shutdowns, and safety hazards. However, corrosion can be prevented or managed in various ways: selecting the right materials, using inhibitors, design modifications, etc. The challenge is finding an engineering solution that has relevant and trustworthy answers & insights all in one place. Knovel contains trusted & vetted best practice guidelines, case studies, property data, interactive content and more so engineers have confidence to solve corrosion problems. In this webinar, see how Knovel can help save you time and cost the next time you have a corrosion challenge. Join us to learn how Engineering Village helped users like you discover top quality engineering research content faster in 2017. Plus, we’ll preview how 2018’s additions will further your research success. • Preview of 2018: Be among the first to preview what Engineering Village has in store for 2018. The Engineering Village team is proud to present a "refreshed" interface! All the existing functionality will be retained but packaged in a clean, modern interface. The focus is on making engineering research easier while maintaining precision search and retrieval capabilities. Join Matt McGarva, Product Manager, Engineering Village, as he demonstrates the power and ease of numeric search to find previously undiscovered data across both Compendex and Inspec databases. As an engineer, you know that numeric data -- e.g., the size of a microchip's components, the thermal properties of a material, the bit rate of a data transfer -- is often key to understanding and getting the most from research articles. Now with Compendex, searching numeric data has never been easier. Sally Fell, Product Manager, Engineering Village, will also highlight 2016 enhancements and our vision for 2017. Critical issues related to gender disparity and bias must be rigorously addressed and supported by a strong evidence base. A preview of Elsevier’s ground-breaking Gender Research Report, with data related specifically to the challenges faced by women in engineering. Join Dr. Christine Grant as she explores professional development strategies in careers ranging from academic to corporate, and provides a new approach to setting priorities and managing the activities and initiatives you’re passionate about. Whether you want to forge ahead in your chosen field or find ways to better integrate work with the rest of your life, this webinar is for you. Women in STEM, and particularly in engineering, have unique options in a wide range of professions, but often must confront challenges from within and without. Rano Burkanova, Head of Talent Development, Elsevier will also offer a brief overview of Elsevier’s commitment to fostering diversity and inclusion in the workplace to advance the efforts of women. This webinar will feature the powerful benefits of having both Compendex and Inspec on the Engineering Village platform. Our presenter Bonnie Osif, will highlight some of the insightful ways researchers are selecting to search Compendex and Inspec databases together to help solve contemporary grand challenges and uncover new discoveries in engineering. Also joining is Tim Aiken, Inspec product manager, The IET, and Steve Petric, Engineering Village product director, Elsevier. Apply our innovative tools to speed search and discovery for more effective research. Engineering Village is the essential engineering literature and patents platform. Refresh your knowledge set and/or learn new ways to facilitate search, discovery, and management of engineering information. Kevin Lindstrom, Physical Sciences and Engineering Librarian at the University of British Columbia, will highlight the in-depth engineering environmental research on receding glaciers and rising sea levels. Learn how researchers can use GEOBASE & GeoRef to gain the insights necessary for predicting the drastic climate challenges that are impacting the earth’s sustainability. Celebrating its 132 anniversary, Compendex is the essential engineering literature database, facilitating search, discovery, and management of engineering information, as the most comprehensive engineering research literature available. Join our webinar to learn how Compendex remains the most accurate, complete and relevant database for your engineering research needs. Engineers expect superior products. Learn how the Engineering Village team works to help meet their needs. 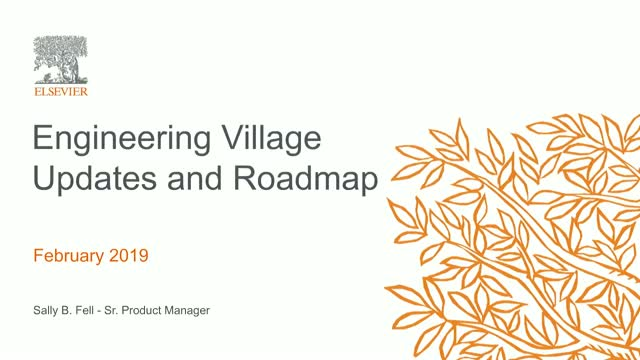 Join us for a webinar that will focus on user-driven features and content updates that were made to Engineering Village throughout 2015 and a look forward to 2016. Elsevier’s Engineering & Technology Solutions brings together incomparable data assets, powerful analytics and technologies to help engineers and geoscientists invent and commercialize ideas, reduce risk, and improve quality.